I have loved having my hands in dirt and clay since childhood living in California. While other little girls were playing with dolls indoors, I was digging in the orange orchard and making mud pies in the sunshine. Now as an adult living on a farm in Winlock Washington, I still have my hands in dirt and clay. I make pottery in the studio and till the earth in my vegetable garden. 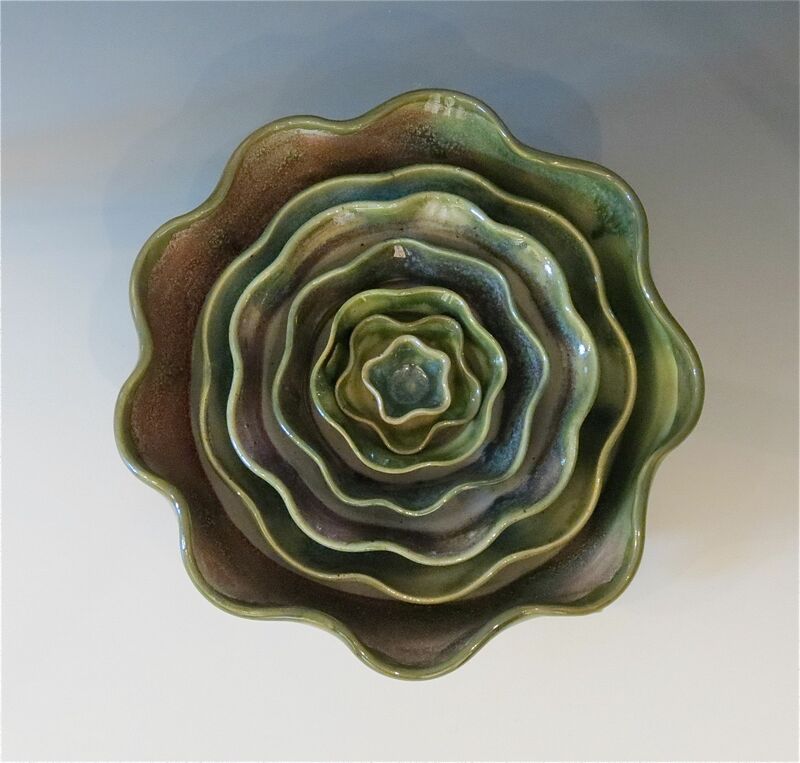 I enjoy the appearance and feel of handmade pottery and find enormous aesthetic pleasure serving meals to family and friends on handmade pottery rather than on manufactured dishes. I am an avid cook and enjoy making pots that I can use to serve the beautiful fresh organic vegetables and fruits from my garden. My work is usually created on an electric wheel and trimmed on a kick wheel. I need the speed of the electric wheel to center the clay but when I trim I like the kick wheel because it automatically slows down which keeps me under control and because it is so quiet. The difference between an electric wheel and the kick wheel, to me, is like the difference between motor boating and sailing. My work has a lot of variety because I use red, white stoneware, and porcelain clays. Some of my pieces are earthy and primitive while others are china white with celadon glazes. Almost all of my work is utilitarian because I like to use hand made items in the kitchen and want others to notice and enjoy the subtle difference between using something manufactured and something hand made. I would like to thank my husband, Richard who has continued to support me along my journey in the clay studio and because he fires the gas kiln. Without him, all I would have is mud.